Karina's Kreations: Artistic Thank You! Isn't this card pretty? I love the Very Vanilla & Basic Black color combination. I designed this card as a thank you card for my customers who placed an order last month. The card is 4" x 4" and uses textured Very Vanilla card stock which really dresses up the card. The center medallion is embossed with Very Vanilla craft ink and Whisper White Stampin' Emboss Powder. 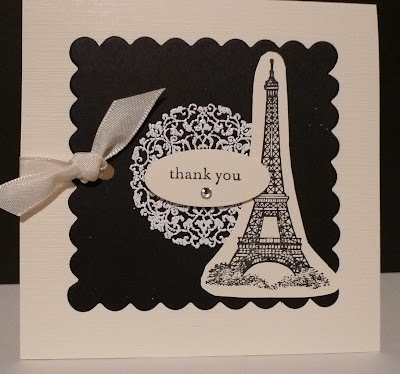 Did you notice the Black scallop square on the card? It's the new Scallop Square Bigz Die from the Holiday Mini catalog. It's only $29.95.